At the request of Gandalf, the heroes are searching for Gollum in the Anduin Valley between the Misty Mountains and Mirkwood forest. Rumours have suggested that Gollum is in this area, and the heroes are looking for clues that might put them on the elusive creature’s trail. After the tutorial Passage Through Mirkwood, where you have paid attention for spiders, the great battle with Hill Troll at Journey Along the Anduin and saving the prisoner before Nazgúl of Dol Guldur from Escape from Dol Guldur, we finally get to our main task, which will accompany us through the whole Shadows of Mirkwood cycle. Gollum. Everything will concern the capture of this little and nasty creature. It’s something like you try to catch some legendary Pokémon. With the difference that during the searching and finding new clues for Gollum, you can die in many ways. MOST ENRICHED SPHERE – sphere, which profits from the new set of cards at most. Heroes are not included in this category. Bilbo Baggins (in short “Bilbo”), one of the Ring bearers, the member of Thorin’s Company, Gandalf’s friend and of course “uncle” to Frodo Baggins, is going to welcome us as the first non-Core hero. At the same time, the Lore sphere is the first expanded sphere by a hero, so from this time, we will have a choice from 4 different Lore heroes. Bilbo comes to with nice starting threat of 9. So if you whine that the Lore sphere offers us 3 heroes (from which Glorfindel has very high starting threat of 12 and Beravor has moderate 10 starting threat), Bilbo can decrease your overall starting threat a bit. In the monosphere Lore deck you won’t begin with overall 30 starting threat (hello, instant Hill Troll! ), but with 27 (if you put away Glorfindel), or with 29, if you let Beravor rest. Otherwise, even in non-monosphere decks, Bilbo can be utilized if you search for lower overall starting threat. That’s enough about threats and lets a look at his stats. In a short glance, we realize that Bilbo has the lowest stats from all the heroes we have met until now. 1 Willpower, 1 Attack, 2 Defense and only 2 Hit Points – in other words, very miserable quester or attacker and under-average defender due to his very low value of Hit Points, which is protected by only 2 Defense. Bilbo is even more fragile than Éowyn or Eleanor (Denethor has an excellent Defense, which protects his low vitality). I would proclaim him as the hero incapable to contribute to any common action. Well, that’s what the underlying issue is behind his low starting threat. But as we know, good abilities have rescued the reputation of many heroes. Does it also concern Bilbo? Our Hobbit hasn’t any action or response, but he is possessed by “forced” effect. The first player will additionally draw one more card in the resource phase. This “little” utility replaces the ability of Beravor, I think. While Beravor has multifunctional usage in every way, her action (which enables us to draw 2 cards) is forcing us to exhaust her. Therefore you actually can’t utilize her assets. You are still facing the “dilemma” if you let Beravor unused for her ability or rather send her to a quest, defend with her or attack with her. At Bilbo you are free from this “issue” – the ability is automatic until he stays alive. And drawing one additional card certainly pleases us. It’s likeable prevention against the phenomenon occurring in the late game – empty hands. I would say even more reliable than any other cards with drawing effect we met in Core set – Beravor, Lórien’s Wealth, Gandalf’s Search, from different spheres Valiant Sacrifice (or from this adventure pack we can mention the new event Campfire Tales). Only Gléowine could compete with Bilbo concerning the reliability of card drawing because this ally is not predestined for other actions as well. However, because of Bilbo’s fragility, there is not a minor chance that you will be finishing the game without him. In the mid and late game, few Evil Storm could end his activity in the game, same as the shadow effect of Hunters from Mordor, if you dare to attach Signs of Gollum to Bilbo. Many things can go wrong and Bilbo is the first target who can get hurt (and die). Because his ability doesn’t require exhausting, you may authorize him to any action. However, during questing Bilbo is endangered by The Necromancer’s Reach, attacking for 1 doesn’t make a considerable difference and defending… I would recommend defending only if you want to commit suicide. For this reason, I slightly hesitate to let Bilbo join my party of heroes because it wouldn’t be for anything else than for his drawing ability. Leadership sphere can offer us in Core set only 2 attachments – Steward of Gondor and Celebrían’s Stone. Though both cards belong to the best we get in the Core set, still we lack more attachments. From another side, we have found in the Core set only a few cards adjusting stats – for example, Protector of Lórien, Dwarven Axe, The Favor of the Lady and few others. Hunt for Gollum comes with the new attachment called Dúnedain Mark, which helps us in a very simple way with adjusting Attack. Dúnedain Mark costs only 1 resource and you may attach it to any hero in the game. Your hero gains +1 Attack. The sympathetic exchange 1 for 1 pleases all players with the economic style of playing. It also pleases heroes like Dúnhere, because he finally can be useful even during a classic fight in your engagement area. Using his ability, attacking enemies in the staging area with 4 Attack seems reasonable to me. At least Wargs stops to be the annoying issue and enemies like Dungeon Jailor or Hill Troll can be scratched (though making them a serious injury would last for very, very long). And unlike most of the previous Core attachment, here the Restricted keyword is missing, so you can attach to a single hero any number of Dúnedain Mark. We have finally obtained the simple and competitive attachment, which boosts Attack of the chosen hero. If the game text would end here, I couldn’t tell you anything else. Fortunately, Dúnedain Mark shows us the second part of its strength. Thanks to its action, you can move this attachment between heroes, for 1 resource from the attached hero. Theoretically, you can make a mistake and attach the wrong hero by this attachment. Or, the hero you have attached was a good target, but during the game, the circumstances have changed and you need boost Attack of another hero. Well, you feel that this action comes in handy mainly in the multiplayer environment. Every player can be endangered by encountering of an unsuitable enemy and it doesn’t have to be your fault. Player, whose deck isn’t built for the battle, may lack enough Attack to beat some enemy. Probably +1 Attack won’t make a big difference in the overall attacking effort. However, it may help that player at least a bit. For example, in the “questing deck” with high Willpower strength, but with the minimum of Attack value, every point of Attack is counted. I can’t remember the moment when I have used this action in real. Maybe it wasn’t necessary at all. I would bet that you won’t use it often either, just simply because you will attach Dúnedain Mark to a hero, who needs it at most. So the first member of Signal-family you will fancy only due to boosting the Attack. Nothing remarkable, just a minor and nice utility. Because in the Core set 7 Leadership allies in total are awaiting us, we can’t be surprised that Hunt for Gollum hasn’t come with any new Leadership ally at all. Instead of it, the new event has arrived to gain our attention. Campfire Tales with 1 cost is holding the tradition of quite cheap Leadership events. When we play Campfire Tales, each player draws 1 card. 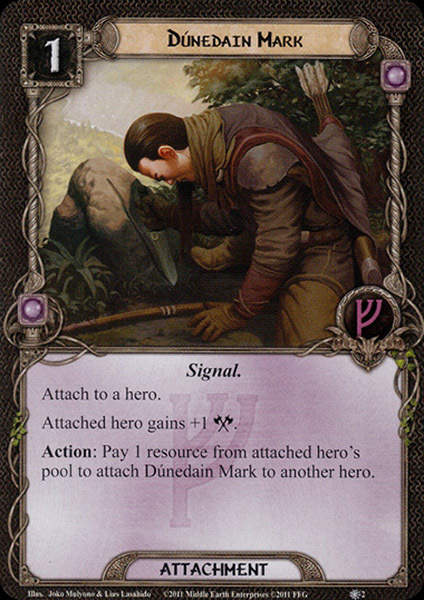 There we are – when I have reviewed Lórien’s Wealth from the Lore sphere, I indicated that we need a more accessible card with drawing effect. Lórien’s Wealth costs 3, for which someone could draw 3 cards. Yes, I have no problem with this exchange, but 3 cost (and moreover in the Lore sphere) I consider for a quite expensive card. We need some cheaper alternative. And our prayers are heard – in the form of Campfire Tales. Even this event doesn’t belong to the Lore sphere, where we would have expected this event subconsciously, it doesn’t matter. Cheap card with drawing effect matches to any deck. However, Campfire Tales isn’t just a card with the simple exchange “1 for 1”. In this event lies more potential than it might seem at first sight. Why is that? With every player involved in the game, Campfire Tales can deal in total 4 cards in one round. Of course, each player draws 1 card, but for mere 1 cost what could you wish more? I like about this card the “teamwork spirit” – the global effect affecting all players and you pay only 1 Leadership resource. Of course, for a solo player, the effect of this card seems quite ordinary, with nothing exceptional. For this reason, I see the including Campfire Tales into a deck more reasonable in multiplayer games. This event isn’t the first Leadership “card-drawing” event – remember on Valiant Sacrifice, where for 1 resource you even draw 2 cards. But it costs you something else – the life of an ally. You couldn’t draw cards just for paying resources, you had to wait for the right opportunity. Campfire Tales doesn’t require any additional conditions, what makes from this event very flexible card. !SPOILER! As for each card with drawing effect, even here is valid you can draw a card, where you know, what you are getting. Thanks to that, you gain a nice advantage. A bit complicated combo you can create from only Core Set and Hunt for Gollum cardpool – Campfire Tales-Gandalf’s Search. However, the better and more straightforward combos you can reach by these combinations: Campfire Tales-Gildor Inglorion, or Campfire Tales-Imladris Stargazer. What can I think up next? Actually, that’s all we can say about Campfire Tales. The usefulness of this event can’t be clearer and surely it appears in your decks. Players will thank you for your generosity and it costs you only a single resource. Truth is, with expanding cardpool you will look the free place for this card more and more harder because the effect of Campfire Tales isn’t so powerful or important that you would have to include it in any deck. Tactic sphere announces the new reinforcement. That’s good news because from the Core set we can create an army from only 4 kinds of allies. The fifth ally is awaiting us in the Hunt of Gollum – Winged Guardian. In Tactic sphere it is the third ally with 2 cost, so you shouldn’t fight with getting him on board. His stats seem – non-traditionally. But you immediately know, what his task exactly is, without looking at the game text. 0 Willpower, 0 Attack, 4 Defense and 1 Hit Point predestine Winged Guardian for the role of the excellent cheap defender. We haven’t met a character with such high Defense yet – the majority of the enemy won’t be able to hurt this ally, excluding the strongest enemies like Hill Troll, Ungoliant’s Spawn or boosted Hunters from Mordor. For 2 cost you gain the resistant wall. But that’s not a whole story, the characteristics of this ally are still awaiting us. First, Winged Guardian has Sentinel keyword, so in the multiplayer environment, you can offer the quality defender to other players as well. 4 Defense will protect your friends from many dangers they will be facing. However, the amazing Defense for 2 cost isn’t for free, as you are going to find out. The first of two restrictions is right behind the Sentinel keyword: “Winged Guardian cannot have restricted attachments.” Why we must face this odd restriction when we don’t have any restricted attachments for allies? Well… in this place, I must confess that I don’t know, which restricted attachment would fit Winged Guardian. But there is one attachment, which could be attached to him, unfortunately, they can’t cooperate together. !SPOILER! Born Aloft – the attachment coming in the next adventure pack incite us to attach Winged Guardian and somehow “bypass” his second restriction about leaving the game right after the defending (if you won’t pay one Tactic resource). The Forced effect, however, must be resolved first, so there isn’t any action window for using Born Aloft. The second restriction will trouble us more deeply: “After an attack in which Winged Guardian defends resolves, pay 1 Tactic resource or discard Winged Guardian from play.” Now we finally find out that Winged Guardian serves as “one-time solution” if you can’t or you are not willing to pay another resource. I would call him the “half-event card” or “ally-event hybrid”, choose whatever you like. But the main point lies in this described restriction: defend with him and then pay or let him die. Thematically, it fits – the Eagle comes to rescue us and then fly away again. Practically, it can or can’t be the trouble for you – it depends on your “richness”, how many Tactic resources you can (or want to) miss for reusing of Winged Guardian. Generally, in mid and late game you won’t have a problem with scarce of resources to such extent as in the first rounds. So the probability of reusing this ally is increasing with your ability to generate a sufficient number of resources (hello, Horn of Gondor or Steward of Gondor!). The first ally from Hunt for Gollum won’t disappoint us at all. We can celebrate that Winged Guardian belongs to Tactic sphere, where we have restricted number of allies (but quite useful allies, I must say). Excellent defender with 4 Defense prevents many dark servants to hurt us or even sacrifice some character. It’s because the majority of common attacks this Eagle can absorb without the necessity of dying. Excluding his 2 cost, you have to pay another Tactic resource for each time you want to defend with him again. This restriction can hurt you at the beginning of the game, but as time goes by, it becomes just a tiny inconvenience. The review of the next Tactic card will be tough because its effect would encourage us to talk about lots of spoilers. Why? Because The Eagles Are Coming! works primarily with larger cardpool – specifically when we get a couple of other Eagle cards. For this event, we won’t pay any resource and that’s a quite sympathetic bonus. When we play it, we search the top 5 cards of our deck for any number of Eagle cards and add them to our hands. After that, we shuffle other revealed cards to our deck. Before moving to pure spoilers, let’s analyze at least some parts of this event. At the first place, we must admit that searching 5 top cards for any number of cards with the given trait, moreover for free, is a useful and nice effect. Of course, it is strongly depended on how many cards of the given traits are present in a deck, but we will talk about this later. It has a very similar effect to another card, by coincidence introduced in Hunt for Gollum as well – the Spirit event Mustering the Rohirrim. So in general, with the arrival of Hunt for Gollum, we have wider and better options, how to get some several wished cards to a play. I don’t exactly know if it is right to use this term in this context, but I would call it the “deck control.” To a limited extent, we may influence, what we get to our hands. Until now, we had to rely only on the “drawing card” effects such as Lórien’s Wealth, Beravor, Valiant Sacrifice or Campfire Tales. Only Gandalf’s Search enables us to manipulate with the order of cards we draw. But The Eagles Are Coming! shows us another kind of deck manipulation or “deck control” – we are able to choose voluntarily the cards with the specific trait and keep them in our hands. It massively supports decks based on the concrete trait. As I have said in one of the Core reviews, traits will begin to play a major role in our decks. The first swallow was Leadership event For Gondor! The Eagles Are Coming! moves trait-synergies to another level – if you control the reasonable number of Eagle cards. At this moment, the only suitable cards for this event are Winged Guardian and another The Eagles Are Coming! While Winged Guardian belongs to a good target, other copy of this event would be a strange exchange. If you want to fully utilize The Eagles Are Coming!, wait for other adventure packs from Shadows of Mirkwood cycle. !SPOILER! 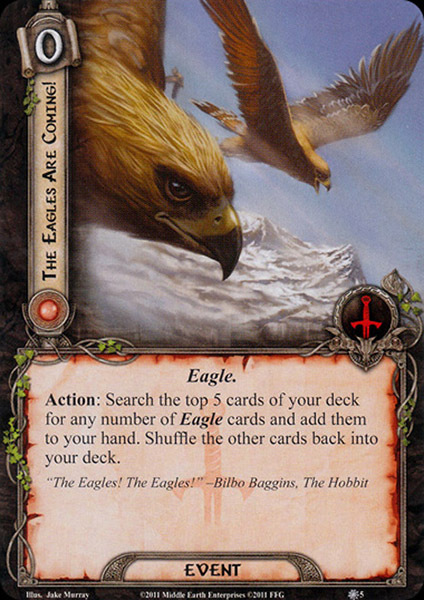 6 different Eagle cards (counting this event as well) will gradually “fly” to our cardpool within Shadows of Mirkwood cycle. So we will have in overall 18 Eagle allies, waiting in your deck for The Eagles Are Coming! Drawing of at least one Eagle card is almost certainty. Outside of Eagle deck, it is clear as day that The Eagles Are Coming! belongs to a totally unusable card. It is also highly depended on the sufficient number of specific cards. But if you play with the reasonable number of Eagles, this event shouldn’t be forgotten, because you gain the perfect advantage and opportunity to influence the composition of cards in your hands, therefore the cards appeared on the board. Note, that from the top 5 cards from your deck you may choose any number of Eagles – so 3 revealed Eagles can stay in your hands. That’s other and indisputable benefit of The Eagles Are Coming! Until now, we could enjoy only 3 kinds of Spirit allies. That’s really little choice. Spirit needs more allies even more urgently than Tactic sphere (which at this moment have 5 kinds of allies). I’m glad I can introduce you to the new reinforcement – Westfold Horse-Breaker. 2 cost for this card seems fair to me, you gain another “early-game ally” (excluding Wandering Took). But don’t expect any miracles regarding his stats. 1 Willpower, 0 Attack, 1 Defense and 1 Hit Point won’t help you much in any effort – 1 Willpower slightly increase your overall Willpower strength, with 0 Attack you can’t even badly look at an enemy and 1 Defense and 1 Hit Point can serve only to simple chump blocking. But it would be a shame to sacrifice him to evil forces just for nothing. As at the majority of other allies, the ability can save the reputation. If you discard Westfold Horse-Breaker, choose a hero from any player and you may ready him. In other words, the Spirit sphere offers us the one-time version of the great Unexpected Courage. But Unexpected Courage can’t be everywhere and besides, for 3 copies of this attachment, we would have to buy 3 Core set. For 3 copies of Westfold Horse-Breaker, it’s enough to buy only one copy of Hunt for Gollum pack, so I consider this ally as a more available option. And definitely, more practical option compared to Common Cause. I must emphasize one inconspicuous detail of this ally, which you may overlook at the first glance – you don’t have to exhaust Westfold Horse-Breaker for using its ability. Such Eleanor, Gléowine or Henamarth Riversong would envy this kind of nice advantage (truth is, without their exhausting the balance of the game could be mindlessly endangered). In practice, you are free to send Westfold Horse-Breaker to a quest, then discard him for readying some hero, if it is needed. No “saving ally” for using the ability as at Gléowine or Henamarth Riversong. You find out soon that this advantage doesn’t appear in LOTR LCG very often (unlike “exhausting condition”). So please, remember this advantage, when you are considering the deck composition. I don’t have to tell you that from Westfold Horse-Breaker’s ability generally benefits heroes with “action-abilities”. Beravor and Denethor enjoy the presence of this ally at the most, I think. However, Aragorn, Gimli or Legolas would be thankful for this ally either. Actually, readying a hero is a useful ability almost anytime and for everyone. For example, if you need to defend some enemy and you lack any defender, who could handle it. Then sacrificing one Westfold Horse-Breaker could in extreme case save you the game, in common case save the life of one character. Westfold Horse-Breaker is a decent Spirit ally (truth is, with the weak stats), which won’t lose in the first cycle at least. Yes, as I said many times before, in the Spirit sphere the options are limited and we are happy for any ally, which is appearing. With the passing time, his position will relatively quickly take over other allies and Westfold Horse-Breaker then would be useful only in some Rohan deck. It’s quite interesting that within the same adventure pack we get two cards with a very similar effect. The first one was from the Tactic sphere, which we have already met – The Eagles Are Coming! introduces us the synergy with Eagles. Spirit sphere comes with own trait-synergy card, more precisely with Rohan-synergy card. It’s called Mustering the Rohirrim. Hunt of Gollum tries to show us, what power can hide in traits. 1 cost for Spirit card is the matter of just one round. When you play it, you search for top 10 cards for any 1 Rohan ally, then you can add him to your hand and rest of the cards you shuffle back into your deck. The difference between Mustering the Rohirrim and The Eagles Are Coming! 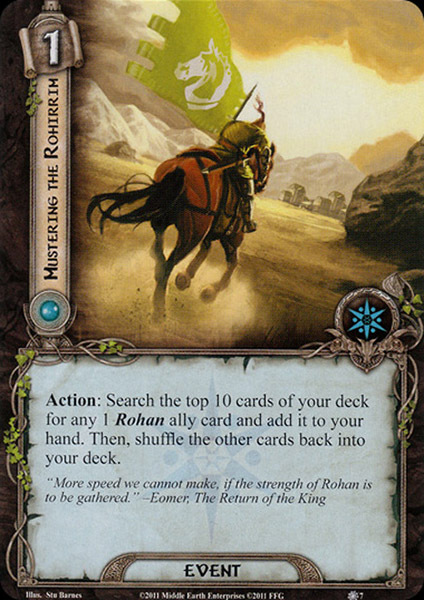 is obvious – instead of searching the top 5 cards you may dig even deeper into your deck for Rohan ally. The probability of encountering the Rohan ally is even twice higher than we were used to the previous “Eagle-event.” But when we say “A”, we have to mention “B”. Even if you encounter 2, 3 and more Rohan allies, you can’t keep them all. You must choose one Rohan, and to the rest of Rohan allies, you have to say goodbye. But that’s a definitely understandable price of this event, you can’t offer more. Additionally, even if you had been allowed to keep all of the Rohan allies, you surely wouldn’t have a sufficient number of resources to pay for. Unless you had an advantage of resource generation (like Steward of Gondor). So I admit it is smartly invented. Now, you are surely interested, how much Rohan allies you can call by this event at this moment. In the Core set, we have met in overall 6 Rohan characters. Let’s count them: Théodred, Éowyn, Dúnhere, Snowbourn Scout, Horseback Archer, and Gléowine. Now subtract the first three Rohan characters, because they are heroes and Mustering the Rohirrim doesn’t be concerned with them. So we have 3 Core Rohan allies. 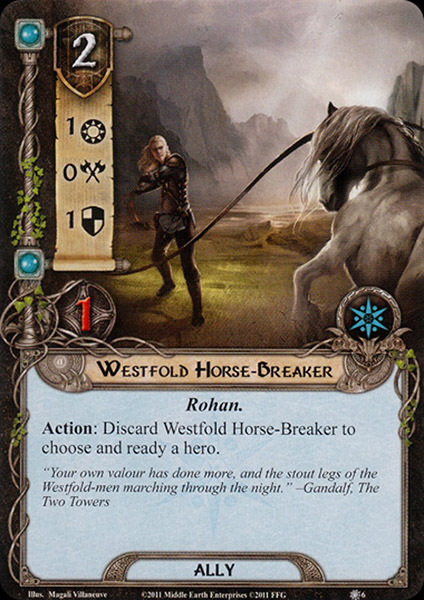 Add the new Rohan ally Westfold Horse-Breaker from Hunt for Gollum pack and we have 4 kinds of Rohan allies. Unfortunately, only the new one belongs to the Spirit sphere, others you find in the remaining spheres – Leadership, Tactic, and Lore. You have very little chance that you will include all these Rohan allies to the same deck. With Songs like Song of Kings, it would be possible, but somehow overly complicated. No, I don’t think this event was for these Rohan allies invented. If you really want to use Mustering the Rohirrim in a good manner, you must wait until a couple of new Rohan allies will appear. For more information we have to touch on some spoilers, like at The Eagles Are Coming! You will include Mustering the Rohirrim to your deck only in case you will play Rohan deck. With lots of Rohan allies, the presence of this event in your deck is the matter of course. Outside of Rohan deck Mustering the Rohirrim doesn’t make sense. It’s another example of a highly trait-depended card with a very good, but specific effect. Beauty woman is playing on the stringed instrument (I’m no expert on the musical instruments, especially in the world of Middle-earth :)) and also singing to woman elf. It looks like a very peaceful scene. But why we should call to our side some singing ally? Is he actually helpful to us? Of course he is. And “singing” painted on the picture thematically responds to the ability of this new ally, known as Rivendell Minstrel. If we haven’t short memory, we could remember that Lore sphere from the Core set hasn’t got any single ally with any stat higher than 1 (except Hit Points). We then have faced a problem of allies shortage, specialized in any of common actions (questing, defending, attacking). Each of these actions had to be resolved by the “strength of mass”. Look at the new Lore ally. For 3 cost we get 2 Willpower, 0 Attack, 0 Defense and only 1 Hit Point. Well, 3 cost for 2 points in Willpower and non-existing attacking or defending potential isn’t a great deal. But we are talking about the Lore sphere within the Core set and Hunt for Gollum environment. We can’t choose someone better, because there is no better quester until this adventure pack. And so, I see Rivendell Minstrel as the above-standard Lore quester. In the monosphere Lore deck, you will feel it immediately – your questing effort stops to be depended on only the sending of some chosen Lore heroes (Glorfindel and Beravor), or on the numbers of 1-Willpower characters, which you can send on a quest and simultaneously you can miss in the other activities. Rivendell Minstrel is the first Lore ally, which contributes to the Willpower strength to a considerable extent. You will find it out yourself if you play in the progression style. Rivendell Minstrel becomes very desired card, drawing from your deck. However, a very desired ally can easily become a very dead ally as well. Due to appearing of well-known The Necromancer’s Reach or Evil Storm, your best ally-quester travels to your discard pile quickly. I think that additional 1 Hit Point would suit her more. The reason, why this ally is “singing” on the picture, is contained in the ability itself. After you play this ally, you can search for 1 card with Song trait and keep it in your hand. Then you shuffle your deck. What are Songs? We will meet one Song in Hunt for Gollum, which actually isn’t a spoiler for you, so you can read further. The Song cards are attachments with very useful utility. Take an example from the first Song we will encounter, Song of Kings. The effect is simple – attached hero gains a Leadership icon. In other words, attached heroes behave as the Leadership hero, though originally he is the Lore hero, for example. You can pay from his resource pool the Leadership cards as well as the Lore cards. The details I will keep for the reviews of Songs themselves. The important conclusion is that Rivendell Minstrel fits at the most in the dual- and tri-sphere decks. You control for example 1 Leadership hero and 2 Lore heroes. You have a sufficient number of resources for the Lore cards (practically very unlikely :)), but you have only a few resources for the Leadership cards. No Song of Kings is available at the moment, but you hold Rivendell Minstrell. After playing her, you search for one copy of Song of Kings and add it to your hand. You gain not only the good quester but in the next round for 1 cost also the solution to the “Leadership resources” shortage. 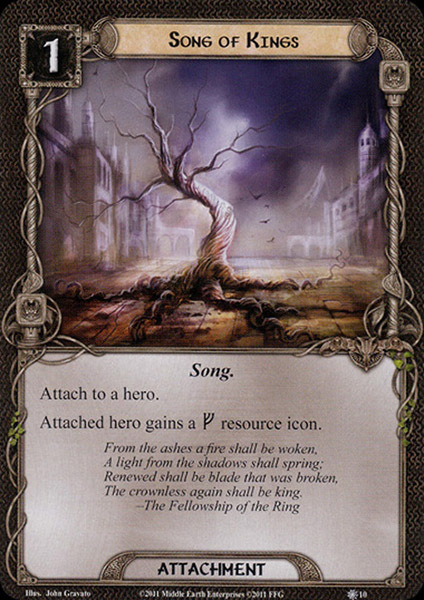 After we will encounter more Song cards (and if we decide to include this kind of cards to our decks), the role of Rivendell Minstrel becomes even more important. Rivendell Minstrel works perfectly with Song cards, as we have found out right now. This kind of synergy can resolve the problem of the missing resources within the given sphere. In tri-sphere decks her presence is desired at the most, in dual-sphere her presence is recommended. As time goes and you will progressively discover the new mechanics, how to fight with the missing resources, she stops to be the important part of the Lore decks. Even her 2 Willpower won’t save her from the oblivion, because she still costs 3 resources, for which you get some points of Willpower, no points in Attack and Defense, 1 Hit Points and the ability, which needs to be fully developed with Song cards. Without any Song card in your deck, she becomes one of the expensive Lore allies. Strider’s Path is the name of the new Lore event we have got in Hunt for Gollum. Simple introduction of the interesting card. For a very friendly-cost event for 1 resource we gain the following response: “After a location is revealed from the encounter deck, immediately travel to that location without resolving its Travel effect. If another location is currently active, return it to the staging area.” Do you remember my review of Strength of Will from the Spirit sphere? If not, never mind, I’ll remind you of the part, where I express one wish: “…Placing 2 progress tokens wouldn’t be bad if you at least can avoid the traveling effect of some locations (Necromancer’s Pass or Great Forest Web). Placing 2 progress tokens on active location without triggering of traveling effect would be undoubtedly useful…” And here we are – 1 adventure pack later we have got the card with that desired effect, without the part of “placing X progress tokens” on a location. I’m not sad about missing this part of the effect, rather I enjoy the second part of the effect – traveling to a location without resolving its Travel effect. Why it should be so important for us and what benefits (or costs) follow from that? I’ll divide the card into several parts, which I’ll analyze. 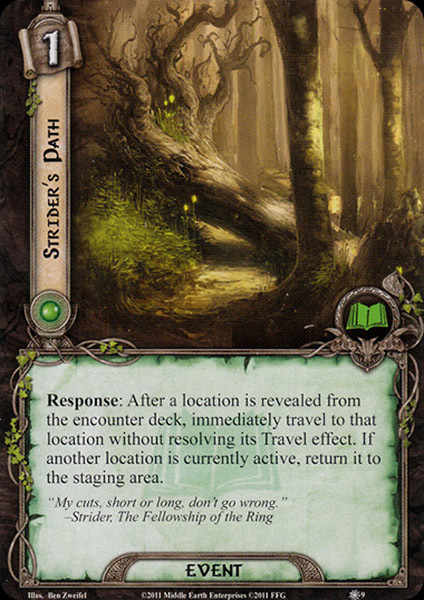 1) After a location is revealed from the encounter deck, immediately travel to that location… The first part is the most universal text on Strider’s Path. I mean, you can benefit from this part, no matter which location is appearing during the staging. The usefulness of this function lies in 2 consequences. First, you can bypass the location with high threats. Locations like Brown Lands or The Old Ford aren’t pleasant encounter cards, which would stay in the staging area for more than 1-2 rounds. The location lock is then very presumable. !SPOILER! And what about drawing such locations like River Langflood, Zigil Mineshaft or Orc War Camp?! It’s a truth that Strider’s Path isn’t friendly with all locations. Generally, except the locations with low threats, some locations punish you for being the active location (The East Bank, The West Bank). However, that’s why there is the second very positive consequence from the Strider’s Path – it is possible to fully explore the active location, which you have chosen due to the effect of this event. How? Everything is happening during the staging, so when you immediately travel to that location, it’s right before the quest resolution. If you quest successfully, all progress tokens go right to that location. So you are able to get rid off one nasty location and moreover travel to another location during the classic travel phase. Thus you decrease the overall Threat strength in the staging area. That’s a very decent bonus. 2) …without resolving its Travel effect… This part defines the uniqueness of Strider’s Path. Travel somewhere without triggering potential Travel effect gives you a big advantage against such locations. Great Forest Web, Mountains of Mirkwood or Necromancer’s Pass stop to annoy you by their Travel effects. Here Strider’s Path shows its great strength and usefulness. However, locations with Travel effect aren’t too much widespread, unfortunately. You have to be well acquainted with the set of locations of played scenario. Or Strider’s Path will fulfill its task only from half. 3) …If another location is currently active, return it to the staging area. The last part could be your advantage or disadvantage – everything depends on the current situation and timing. Of course, if you exchange worse current active location for new less bad active location, you are making a silly mistake. But if the current location isn’t so bad, you can get rid off “the stopper” smartly. The East Bight is the example for all because this location forces you to travel there, if another location isn’t active. Moreover, 6 Quest Points mustn’t be an easy task for you. Strider’s Path pushes away The East Bight and replaces it for another, more important and critical location. The charm of Strider’s Path I’m discovering just right now. Before that, I was overlooking this event constantly. I couldn’t imagine, how useful could be Strider’s Path. As I have pointed out, it depends mainly on the set of locations present in the played scenario. It follows that Strider’s Path won’t fit in every scenario, so I see this event as the perfect sideboard card. Okay, here I make the exception. In what and why? Because through Shadows of Mirkwood cycle we will get 4 almost identical cards, which belong to a neutral sphere. The difference between them is about one word (or symbol, more precisely). It’s not like the difference between Secret Paths and Radagast’s Cunning, or among the Leadership “Dúnedain attachments” coming in Shadows of Mirkwood cycle (sorry for that little unmarked spoiler :)), where the difference in the text could be minimal, but with considerable dissimilar impact on the game. I couldn’t make up 4 unique reviews for 4 nearly identical cards, so I write 4 identical reviews with only unique summary of the given card at the end. I hope you won’t consider it for the deficiency of my inventiveness. ;) Well, let’s hit the road. Song of Kings is the neutral card. That means you don’t have to take into consideration the sphere of influence. You can pay its 1 resource from the pool of any hero. For this price, you get an attachment, which changes the sphere of influence of the attached hero. Or more precisely, the attached hero gains another sphere of influence. A hero can pay for cards from its original sphere of influence, but also for cards from the sphere of influence written on the attachment. Let’s explain it on the example. You control the Glorfindel who belongs to the Lore sphere. Attach him Song of Kings and you may pay the Leadership cards from him as well. It’s like you gain another Leadership hero with the difference that you are free to decide, if you pay for Lore or Leadership cards, from a single hero. Suddenly you realize that the common problem with “not enough resources” within some sphere you can at least partially resolve by this kind of effect. It’s cheap, it’s simple and it’s an effective way, how to deal with the lack of resources of some sphere. It’s the matter of course that “discarding attachments” effect of some encounter cards means great menace for every Song attachment. So I recommend you to include to your deck more copies of this card. For this kind of cards is just Rivendell Minstrel created. You don’t have to wait for the drawing of this Song. 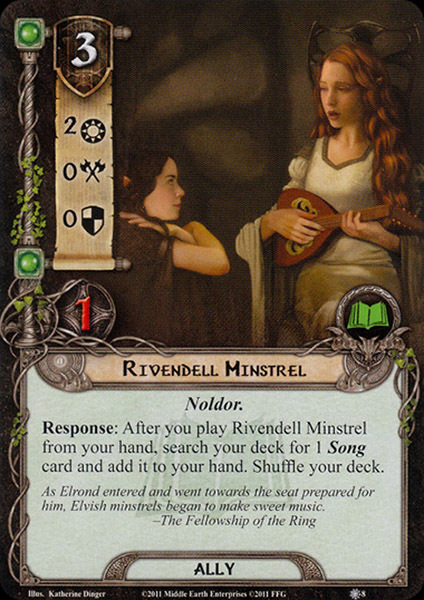 If Rivendell Minstrel is present at your hand, her ability helps you to dig through the deck for the desired Song card and add it to your hand. Then you can profit from its effect. And how specifically is Song of Kings useful? To be honest, with Song of Kings you gain access to a sphere, which is well-known for the “friendly-resource environment”. In other words, you don’t languish by the lack of resources so often as in other spheres. It’s because of the ability of the resource generation (Steward of Gondor, Glóin) and relatively cheap cards. That’s why I see Song of Kings as the least beneficial Song. Bilbo Baggins as the first non-Core hero tries to persuade us to include him to a deck in place of other Lore heroes – Glorfindel, Beravor or Denethor. His passive and useful ability, which favours the first players in form of drawing one more card, is the interesting “antidote” against the occurrence of “empty hands” and provide us more choices. However, he is Hobbit and the weak one from the sight of the stats. He becomes surely the most vulnerable part of your hero’s party. Including him to a deck means risking that you will be finishing the game without him (if you somehow won’t adjust Bilbo’s stats). In my point of view, allies from Hunt for Gollum are the most necessary and desired cards from all types of cards. Why allies? Tactic, Spirit and even Lore sphere from the Core set needs urgently new reinforcements. Tactic sphere has got only 4 kinds of allies, Spirit sphere has got even 1 kind of ally less and Lore sphere, on the other hand, lacks for better contributors for any of common actions. Winged Guardian has arrived in the Tactic sphere as the first Eagle, with the great defense quality. Getting 4 Defense for 2 cost is the magnificent exchange, though another cost lies in the “one-time usage” (if you won’t pay 1 resource). I see Winged Guardian as the reliable defender, who can help you and your friends, thanks to his cool Sentinel keyword. Westfold Horse-Breaker enters to the Spirit sphere as the great help. Among two expensive allies (Lórien’s Guide, Northern Tracker) and one cheap ally (Wandering Took) looks Westfold Horse-Breaker like salvation, despite his stats belongs to the worse average. His flexible ability comes in handy, where Unexpected Courage isn’t present. And 2-Willpower Rivendell Minstrel is the “one-eyed king among the blind”. Though he doesn’t belong to a perennial star, within Hunt for Gollum pack and/or if you play Song-deck, this ally is doing a good and fair job – he can quest and search effectively for any Song you need. Only that 3 cost seems unfriendly within the Lore sphere. In Core set with Hunt for Gollum pack, we welcome any new ally, no matter of the real quality. However, with the present cardpool, Winged Guardian is the only ally, who is competitive, thanks to his defending potential. Other 2 allies have no stats or abilities, which would make them resistant to progressive oblivion. Each sphere of influence comes with own new event in Hunt for Gollum, though events aren’t so critical necessary as allies. 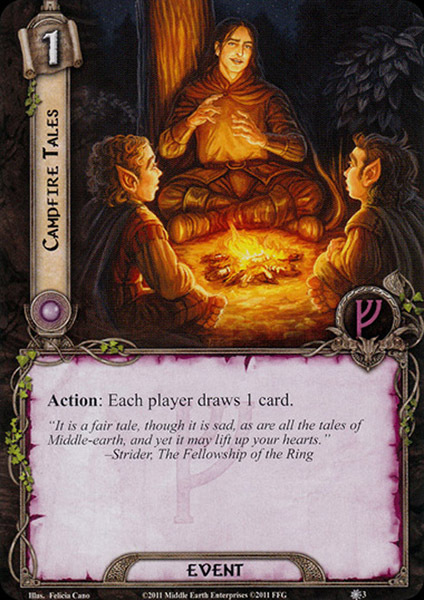 Simple drawing card in form of Campfire Tales is a nice minor utility, which won’t disappoint you or your mates. Of course, if you draw some good card, your happiness will be twice bigger. It’s the answer to the expensive Lórien’s Wealth or situational Valiant Sacrifice. Lore sphere shows us considerably interesting event Strider’s Path – the perfect sideboard card, which allows us to bypass Travel effect of the chosen location. It’s a card not to be born for every scenario. But if you encounter some locations with nasty Travel effects, Strider’s Path helps you to not worry about them more. Last 2 events have similar effects, but each of them aims to allies with different traits. The Eagles Are Coming! calls to the battle Eagles within top 5 cards of your deck, while Mustering the Rohirrim digs through top 10 cards of your deck for 1 Rohan ally. The trend is clear – gradually utilize the strength of trait-synergies. Although these events have limited use in Hunt for Gollum, their usefulness will be increasing with each new adventure pack. If you run Eagle or Rohan deck, including the first or second event to your deck is a duty. When I compare all kinds of cards from Hunt for Gollum, I must say that events are the most successful and most useful one, with good utilization even in future. I definitely recommend you to have a try at some from these events, no matter if you own some expansions and packs further. And the final evaluation of attachments? Nothing miraculous, nor outstanding. I have nothing to say more about. So how do you enjoy the first adventure pack of LOTR LCG? Regardless of the number of bought Core sets, every player must be excited about the new cards, which will come to your hands. Was it worth it for the waiting? I have one bad news for players who love the deckbuilding – with Hunt for Gollum you are still not able to make up some original deck. At least in monosphere environment. This was my discovery during the playing with monosphere decks in progression style. With dual- and trisphere decks, the options for deckbuilding are definitely different, of course. However, no matter how many spheres do you want to include into your decks, what Hunt for Gollum offers us? I was very surprised and simultaneously pleased by the usefulness of events and I like them all. I think that Hunt for Gollum hasn’t made a wrong decision with events generally. 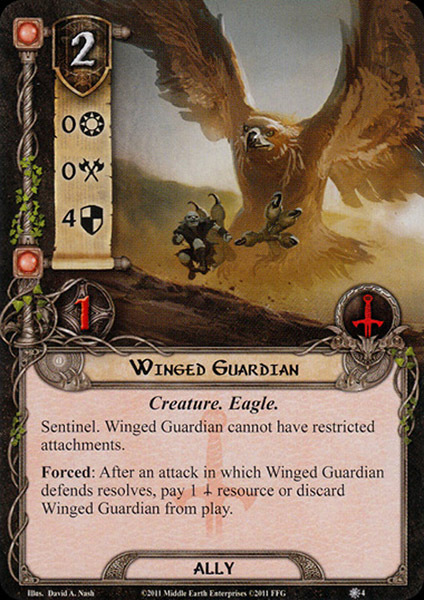 But I see Winged Guardian as TOP CARD of Hunt for Gollum from several reasons – cost, defense potential and Sentinel keyword made from this ally important part of any Tactic army, no matter if you run Eagle deck. The strength had to be balanced by paying 1 additional resource if you want to defend with Winged Guardian repetitively, but I don’t find it very limiting. Other allies fill the role of “other bodies” in your deck (Westfold Horse-Breaker) or new quester champions (Rivendell Minstrel). Attachments, on the other hand, have shown us nothing breakthrough. It’s not downright trouble, but if you hope in something great as Steward of Gondor, Unexpected Courage or Protector of Lórien, you will be disappointed. 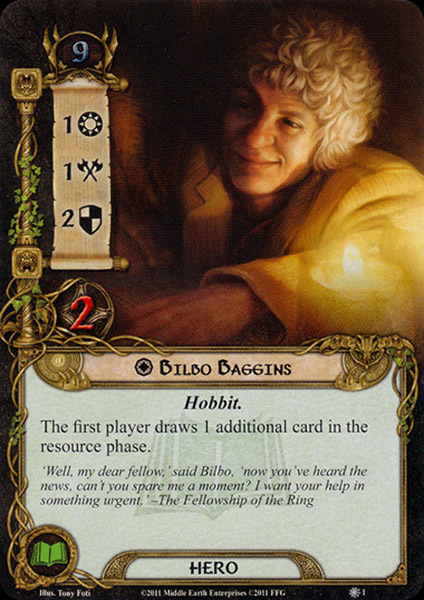 The biggest trouble (= SHEEP CARD), however, has happened in a “hero environment.” Bilbo Baggins has a decent passive ability, protecting you from “empty hands” and extending your choices (as the first player). But the stats predestine you to watch carefully for every treachery appearing from the encounter deck because Bilbo won’t hold for very long. Finishing the game without him is quite presumable. No, this Lore hero hardly appears in my deck instead of Beravor, Denethor, or even Glorfindel. And which “Core sphere” is enriched at the most? At this moment, Lore sphere has got the perfect sideboard event Strider’s Path and a good quester Rivendell Minstrel with 2 Willpower and ability with Song-synergy, useful mainly with next adventure packs. Hunt for Gollum distributes to every sphere with a good set of cards generally, so I see the first adventure pack as suitable for buying, even you don’t want to play in progression style. Your Rohan and/or Eagle decks will need this adventure pack for sure. What’s the name of that TCG? Is it still in print? At first glance I thought those were Magic cards. They are cards from the Lord of the Rings: Living Card Game. A game by Fantasy Flight Games that should still be in print for the majority. It is unlike Magic a coop game for up to 4 players and has more of a story element to it. It is not part of the TCG, which died out a decade ago, though many players have switched to this game.